Han Solo�s ever-faithful companion, Chewbacca isn�t afraid to follow his friends into battle. Once there, it isn�t hard to see how he can aid Rebel commanders as they attempt to capture crucial objectives or secure a foothold on the battlefield. His immense strength and personal connection to Solo, Luke Skywalker, and Leia Organa make him a natural choice to join these iconic heroes on the battlefield as an operative. 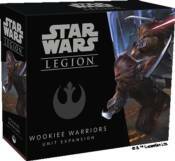 Inside the Chewbacca Operative Expansion, you�ll find everything you need to add Chewbacca to your Rebel army. A single unpainted, easily assembled miniature depicts Chewbacca roaring into battle, his trusty bowcaster at the ready. Three upgrade cards provide more tools for preparing Chewbacca and your other units for battle, and three command cards can add more variety to your hand, allowing Chewbacca to team up with the three Rebel commanders.